Harley-Davidson®dealers across Europe, Middle East & Africa (EMEA) are set to compete for the title of top custom bike builder in the second edition of ‘Battle of the Kings’, a winner-takes-all customising contest. 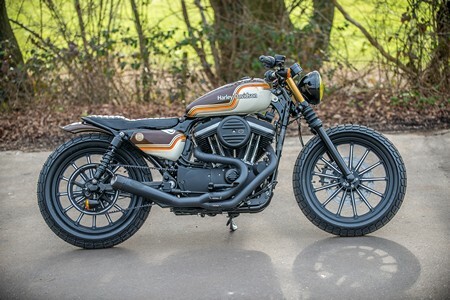 The ‘Battle of the Kings’ contest, which takes place between December 2015 and June 2016, will involve staff from authorised dealerships across Europe, the Middle east and Africa, competing to demonstrate their originality and creative customisation skills on a 2016 Iron 883. With our bike we have tried, yet again, to reinvent the wheel. By making the bike look different with subtle changes. Our bike is not about sudden impact but more of a build that has been motivated by the current motorcycling trends of retro and brat bobber. It needs to be appreciated for build quality and thought rather than glitz and glamour. It’s about the stance, silhouette, ride ability, fashion, the statement that it makes to the public. Think brat-bobber, Brit culture and a new wave of motorcycle custom trends that puts more European flavour into the American dream. We've always liked the term in sport used to describe winning, and winning is what it’s about: winning trust, winning confidence, winning team etc. Actually, the name comes from Vegas where a chicken dinner with potatoes and veg was $1.79 and a standard bet back then was $2.00, so you won and could then afford a chicken dinner. In my twisted way of looking at things, I would say that customising an Iron is affordable; it’s a way of having a gamble and having your dinner, too. It’s a way of having something really cool, individual, and something that looks the part but really affordable to customise. No one has to have a full Battle of the Kings budget; you can start where you like and finish where you like. VIEW MORE IMAGES OR VOTE FOR US NOW! I’ve worked for Shaw Harley-Davidson®since the store opened in 2002. I’ve always loved two wheels but working with the brand took my passion to another level. Rather than just loving the metal, I’m passionate about what makes motorcycling so great: the people, fun, the social side, lifestyle and fashion, and more. A dealership like ours is like working in a fun factory. It sounds lame but we really do help people achieve dreams, especially with our custom side of the business, which is fulfilling. Without our natural passion for bikes then we would just be average. We believe Harley-Davidson®dealerships are naturally thought of by people as Custom Shops. People expect custom work to be done at another level where anything is achievable. We provide just such a service and this opens new doors and other doors wider. Customers and potential customers get exactly what they want – a bike that they may have seen and never thought possible. This gives greater confidence to those who are not big into customising but want someone they trust to prepare a bike for them. My experience is based on being with Shaw Harley-Davidson®for 14 years. Prior to this I was a technician in the motor trade. I am not hands on with the custom bikes but work as part of the team. We share ideas and work closely together and this is what makes us different from the rest. Teamwork makes the Dreamwork... This drive, I guess, made us the World Champion in Modified Harley-Davidson at Sturgis USA in 2010.